Produced with a combination of premium cigar leaf tobacco and infused with blueberry, these cigarillos are surely tangy and wild! This fresh off the flavor taste will keep your taste buds thirsting for more! The refreshing infusion of menthol provides a luxurious escape from your day-to-day grind. This cigarillo’s green leaf adds a mild herbal element bringing mellow flavors to the forefront. What happens when you blend the flavors of refreshing strawberry cream with premium cigar tobacco? Pure mouth watering bliss, like fresh strawberry shortcake. 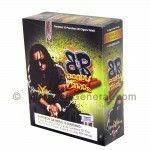 Decadently infused with strawberry, this cigarillo delivers an unmatched dessert-like smoking experience. 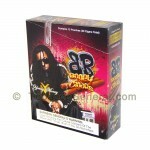 Known for its candied flavor, white grape cigarillos are sweet tasting and mild with premium cigar leaf tobacco. 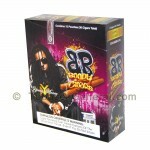 This is ideal for those who want a delicious smoke with a pleasant after taste. What better flavor than wine grape to make you want to celebrate? Anyone can find sanctuary in the deliciously complex flavors of red wine. Add that to premium cigar leaf tobacco and you get a one of a kind luxury smoking experience.